I feel like I haven’t posted an actual MEAL in a loooooong time. I’m all about that raspberry brownie and regular brownie and nanner bread life. Baking is definitely one of my favorite forms of self care. Chocolate is my love language! As much as I love sweet snacks, I swear I eat real food, too. Although lunches as of late look like Amy’s burritos, smoothies, or quick food from Alchemy, I’m pretty big on cooking something homemade for dinner for me and Jeff during the week. Having leftovers in the fridge is like a giant warm hug after a long day. 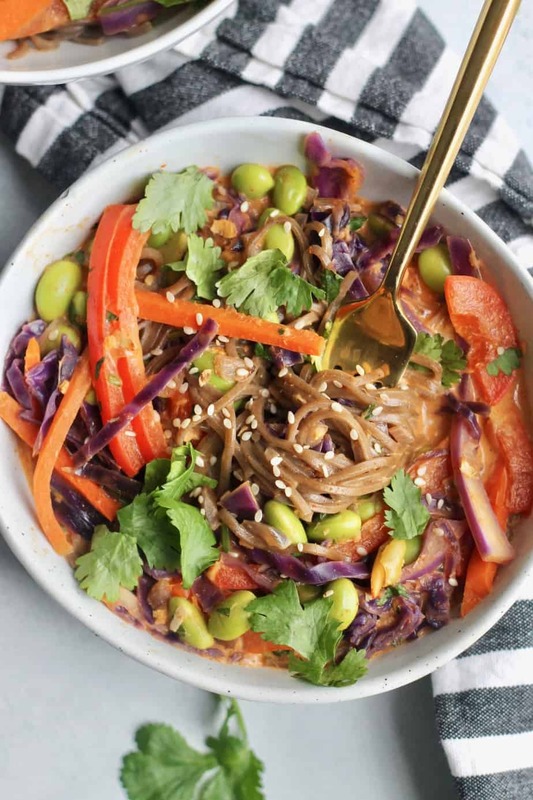 Enter these Thai Curry Soba Noodle Bowls! They’re gonna hug you hard, I just know it. I always make meals that’ll last us for at least two nights—usually one on Sunday and then something else again on Tuesday. Our go-to’s are Easy Vegan Lasgana, Easy Vegetable Teriyaki Stir Fry, Tacos, or Slow Cooker Smoky Walnut Chili. You know what’s missing from that worldly-inspired drool fest?? CURRY!! Mmmm the Thai kind. If you make my recipes at home, you know that I’m always on team garlic and ginger. Flavor town! I’m combining my three favorite things when it comes to plant powered meals in a bowl—whole grains, bright veggies, and a bomb sauce. If you can’t find buckwheat soba noodles at the store or want to whip this up with what you already have in your pantry, you can use rice noodles (great for gluten-free! ), spaghetti, or linguine instead. I used a bunch of colorful veggies here but you could also use broccoli, peas, shrooms, bean sprouts, and whatever else you fancy. Trust me when I say they make these Thai Curry Soba Noodles for dinner. The leftovers taste even better the next day! Cheers to sharing scrumptious, healthy meals with someone you love and better yet…LEFTOVERS! I am SO feelin’ this today. Looks delish!! OMG! This is so delicious. We had it last Monday and everyone loved it. Thank you so much for sharing this recipe. It is a must-try for everyone. This is an awesome bowl!! I don’t make a lot of things more than once, but I will make this again, and again… Thanks for a great recipe! Perfect week night meal! Just can’t beat coconut curry! Next time I may add a dash of red pepper flakes for a bit of spice too! so easy, so good! very yum. thanks!